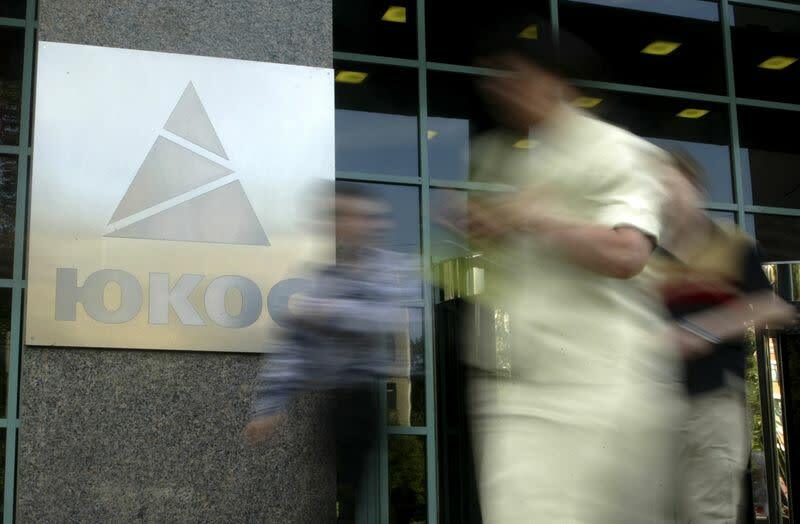 MOSCOW/STRASBOURG (Reuters) - Europe's top human rights court awarded shareholders in Yukos 1.9 billion euros ($2.6 billion) in damages on Thursday, a new blow to Russia days after some of the former oil company's shareholders won $50 billion in The Hague. The Strasbourg-based court found that Russia had failed to "strike a fair balance" in its treatment of Yukos, once run by former oligarch Mikhail Khodorkovsky, and had forced the company to pay excessive fees. While the 1.9 billion euros awarded by the European Court of Human Rights (ECHR) is a fraction of the 38 billion euros which Yukos sought, it hits Russia hard at a time when the country is on the brink of recession and is reeling from tougher sanctions imposed by the West this week over its actions in Ukraine. "We received the news with a great joy, this is an unprecedented decision, the court has never ever awarded such a big sum," said Olga Pispanen, a spokeswoman for Khodorkovsky, who was arrested at gunpoint in 2003 and convicted of theft and tax evasion in 2005. He was released last year after 10 years in prison. Yukos, once worth $40 billion, was broken up and nationalized a decade ago, with most of its assets handed to Rosneft (ROSN.MM), an energy giant run by an ally of President Vladimir Putin. Russia's Justice Ministry said the ECHR ruling was unfair and biased and said it could appeal within three months. The court also ruled Russia should pay 300,000 euros in costs and expenses, plus any tax. Yukos had requested 4.3 million pounds ($7.3 million) in legal fees, $174,000 for costs of an expert report and $588,148 for other fees. "The awarded amount is already totally unprecedented in the human rights field," said Jan Kleinheisterkamp, associate professor of law at the London School of Economics. "1.9 billion euros is humongous in terms of compensation granted by the ECHR." Yukos had argued in the ECHR that Russia had unlawfully seized it after imposing bogus taxes and via a sham auction. An interim ruling by the ECHR in 2011 found that Russia had not misused legal proceedings to destroy Yukos but ruled that enforcement proceedings used against Yukos had been disproportionate. It invited a claim for 'just satisfaction', or compensation, from Yukos. Yukos had sought compensation of just under 38 billion euros. This was based on a valuation by a specialist energy firm, according to a source close to the claim. The damages were being sought on behalf of all Yukos shareholders. There are around 55,000 named Yukos shareholders, some of which are funds representing a number of shareholders. "This is another confirmation of the fact that everything that Russia did against the oil company, was illegal," Leonid Nevzlin, a former Yukos executive and top shareholder, told Echo Moskvy radio. He said this was a consequence of Russia’s refusing to seek for a compromise with Yukos abroad.